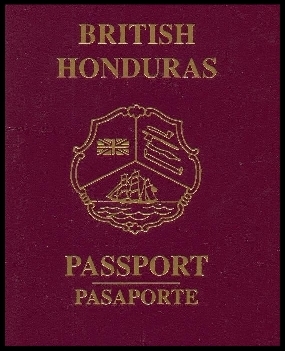 British Honduras passport (now Belize) was a British Crown colony until June,1973. This is a common example of a Camouflage passport. A Camouflage passport is a document, designed to look like a real passport, issued in the name of a non-existent country or entity. A camouflage passport is not a real, valid passport and is to be distinguished from a valid second passport, which an individual with dual citizenship may be eligible to hold. Camouflage passports are generally produced in the name of countries that no longer exist or have changed their name.Often these are former colonies that changed their name on independence. Others use the names of places or political subdivisions that exist within a real country, but that have never issued or cannot issue passports, for instance the British Hebrides which are islands off the west coast of Scotland that have never been separately independent. Usually, the names chosen have a plausible or familiar ring to them. "Fantasy" or "Cover passports" are passport-like documents issued as a novelty or souvenir, to make a political statement or to show loyalty to a political or other cause. Souvenir United States state passports have also been issued, for Nevada or the Republic of Texas for instance, but these typically are clearly marked as novelties.